PEACE TALKS RADIO, the series on peacemaking and nonviolent conflict resolution, is now available as a free weekly series. "We air Peace Talks Radio weekly on KXOT. It fits well in our schedule and provides timely programs about peace, relevant to current events at home and abroad." Write producer Paul Ingles (paul@paulingles.com) for more details. Or, consider the latest episodes for your special programming, available at PRX. Most programs are also available in 29:00 versions. Peace Talks Radio, the series on peacemaking and non-violent conflict resolution, features Jane Davis of HOPE-HOWSE which stands for "Help Other People Evolve through Honest Open Willing Self Evaluation." For years, Jane has been traveling to death rows and prisons around the country and around the world, counseling inmates to help them find the goodness inside them and help them achieve some inner peace. 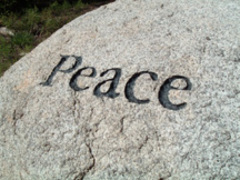 Peace Talks Radio, the series on peacemaking and non-violent conflict resolution, features Jane Davis of HOPE-HOWSE. In December 1993, Jane was asked to be a media witness at an electric chair execution in Georgia. She says witnessing the execution made everything inside her go "haywire." She writes, "This isolated act of killing another human being...left no alternatives. It took away all hope." Since then Jane has been traveling to death rows and prisons around the country and around the world, counseling inmates to help them find the goodness inside them and help them achieve some inner peace. She has worked with at-risk youth as well and has advocated against the death penalty. "HOPE-HOWSE" stands for "Help Other People Evolve through Honest Open Willing Self Evaluation." She talks about her work with Carol Boss. In part two of the program, we rebroadcast our visit with musician and death penalty opponent Steve Earle from 2004 and hear some voices in support of the death penalty from the debate in the New Mexico State Legislature that year. New Mexico ultimately abolished the death penalty in 2009. Millions and millions of views on You Tube to date. That's the number of times the unique rendition of the song "Stand By Me" has been seen on the internet. The song featured contributions from street musicians and indigenous performers around the world and inspired a whole CD called "Songs Around The World," a DVD called "Peace Through Music", a live tour, and a non-profit organization called the Playing For Change Foundation that has raised money to build music schools in developing countries. Can a project like this really promote peace in a noticeable way? The story on this edition of Peace Talks Radio. Millions upon millions of views on You Tube to date. That's the number of times the unique rendition of the song "Stand By Me" has been seen on the internet. The song featured contributions from street musicians and indigenous performers around the world. The collaboration inspired a whole CD called Songs Around The World , a DVD called Peace Through Music , a live tour, and a non-profit organization called the Playing For Change Foundation that has raised money to build music schools in developing countries. Can a project like this really promote peace in a noticeable way? On this edition of Peace Talks Radio , Carol Boss talks with project co-founders Mark Johnson and Whitney Burditt and two of the music performers - Clarence Bekker from The Netherlands and Mermans Kenkosenki from South Africa. This time Peace Talks Radio considers two men – Greg Mortenson and Dr. Mohammad Khan Kharoti (Hah-ROH-Tay)- who firmly believe that the path to relieving suffering, reducing conflict, and promoting peace in the troubled and chronically war-torn country of Afghanistan is by building schools. Schools for young Afghan boys and especially for young Afghan girls for whom education and basic literacy has been denied. On this edition of Peace Talks Radio, two men – Greg Mortenson and Dr. Mohammad Khan Kharoti (HAH-ROH-TAY)- who firmly believe that the path to relieving suffering, reducing conflict, and promoting peace in the troubled and chronically war-torn country of Afghanistan is by building schools. Schools for young Afghan boys and especially for young Afghan girls for whom education and basic literacy has been denied. Greg Mortenson is the author of the best selling books THREE CUPS OF TEA and STONES INTO SCHOOLS. He’s founder of the Pennies for Peace program, and co-founder of the Central Asia Institute. Mortenson has raised the money and resources to build over 130 schools in Pakistan and Afghanistan- expanding the horizons and hopes of tens of thousands of young boys and girls. Also on the program, a less well-known school builder in Afghanistan who built a school in 2001, which flourished into 2008 before it was destroyed by militants. The man behind the school was Dr. Mohammad Khan Kharoti who was born in a nomadic Afghan tribe in the 1940's to poor parents. In 1970, an American family in Iowa helped support him in the U.S. while he got the early education that prepared him for medical school back in Afghanistan. Now he's a U.S. Citizen and doctor of nuclear medicine at Kaiser Permanente Hospital in Portland, Oregon where he established Green Village Schools, a non-profit organization, to raise funds for his school building efforts. Finally, a profile from reporter Mary Anne Meyers of a young Iraqi refugee who studies music in Indiana through the Iraqi Student Project, which invites US colleges and universities to accept qualified students who have lived most of their lives in Iraq, giving these students tuition waivers for undergraduate study. This program is also available in a 29:00 version on PRX. Elementary, Middle and High School students all share stories about conflicts they face everyday, how they resolve them, and ideas about how to help make this a more peaceful planet. This time we talk with young people to hear their ideas about what it takes to make peace and resolve conflict. Second to fifth grade students have a lot of good ideas as it turns out. We talked with a diverse group of 15 youngsters who were attending Sunday youth activities one morning at Albuquerque's First Unitarian Church. We also visited with three teen members of KUNM's Youth Radio Project: Luke Iha, Bashar Jawad and Amanja Lambert. Why are people so reactive to one another? Why is it challenging to keep peace in our families and workplaces? Two psychologists and authors, Daniel Goleman and Rick Hanson, explain the brain’s role in social intelligence and how we can manage our brains to be more peaceful in social interactions. Suzanne Kryder hosts with Paul Ingles. Why are people so reactive to one another? Why is it challenging to keep peace in our families and workplaces? On this edition of Peace Talks Radio, we’ll explore the field of social intelligence - or a person’s ability to understand his or her environment optimally and react appropriately for peaceful outcomes. Suzanne Kryder talks with two authors who will explain the brain’s role in social intelligence and how we can manage our brains to be more peaceful in social interactions. Dr. Daniel Goleman is an author, psychologist, and science journalist. For twelve years, he wrote for The New York Times, specializing in psychology and brain sciences. Goleman authored the two best-selling books, Emotional Intelligence and Social Intelligence. In 2009 he published Ecological Intelligence: How Knowing the Hidden Impacts of What We Buy Can Change Everything. We’ll also speak with Dr. Rick Hanson, a neuropsychologist and co-author of the book, Buddha's Brain: The Practical Neuroscience of Happiness, Love and Wisdom. This time on Peace Talks Radio, we hear about two organizations working in conflict-ridden parts of the world. Both organizations make use of unarmed accompaniment, and other peacemaking strategies, to help support people doing peace and human rights work in places like Columbia, Guatemala, Sri Lanka and the Philippines. This time on Peace Talks Radio, we hear about two organizations working in conflict-ridden parts of the world - both dedicated to nonviolent methods of protecting civilians, human rights workers, and facilitating dialogue between conflicting sides. Host Carol Boss will talk with three people affiliated with Peace Brigades International - Katherine Hughes-Fraitekh, Dana Brown and Liam Mahony- as well as the former director of the Nonviolent Peaceforce, Mel Duncan. Both organizations make use of unarmed accompaniment, and other peacemaking strategies, to help support people doing peace and human rights work in places like Columbia, Guatemala, Sri Lanka and the Philippines. There is also a 29 minute version of this program here at PRX. Whether on the playground or in the office, teasing behavior and put-down humor can certainly give rise to conflict. Yet there are studies showing that good natured teasing can strengthen social bonds. A thoughtful discussion on this nuanced topic this time on Peace Talks Radio. All you have to do is hang out with young people for awhile and you'll see and hear it start. A stream of teasing and zingers, followed the victim's call to their mom and the usual disclaimer of "I was only kidding," from the teaser. Teasing and put-down humor have been around almost forever. Despite many documented stories of it going horribly wrong, we've also all heard, and some researchers have studied and reinforced, that teasing behavior can also be a sign of affection and inclusion in a group. The "we only tease the ones we love" explanation. But a look toward popular humor - in sitcoms, movies and from stand-up comics - suggests that the put-down zingers only seemed to have escalated in recent decades. It's all left us wondering if, on playgrounds, in offices, and in families, many of us aren't trying to imitate these humor models, looking for that approving laugh track in our heads, without thinking about whether we might be contributing to conflict...or where the line is between benign good humor and agression or even verbal violence. And why does this type of humor seem to be such a sure-fire formula for comedy success? Also why does entertainment that merges violence with humor make some people laugh, while others squirm? The "Third Side" looks at conflict not just from one side or the other, but from the larger perspective of the surrounding community, or “third side.” In the latest episode of Peace Talks Radio, host Suzanne Kryder talks with Dr. William Ury, co-founder of Harvard University's Program on Negotiation and author of "The Third Side". Also two Ury students talk about applying Third Side principles to their own negotiation work. Do you work to transform destructive conflict into cooperation? Can you take the "Third Side" in the conflicts around you even when you’re a party to the conflict? The "Third Side" looks at conflict not just from one side or the other but from the larger perspective of the surrounding community, or “third side.” In the latest episode of Peace Talks Radio, host Suzanne Kryder talks with Dr. William Ury, co-founder of Harvard University's Program on Negotiation and author of The Power of a Positive No: How to Say No & Still Get to Yes and Getting to Peace (released in paperback under the title The Third Side). Dr. Ury has worked as a mediator and negotiator for over 30 years in corporate mergers, wildcat strikes in a Kentucky coal mine, and among the Bushmen of the Kalahari. He says that it takes two sides to fight, and a third to stop; that third side can transform our daily battles into creative conflict and cooperation at home, work, and in the world. We also talk with people who have used the "Third Side" approach to ending conflict in their communities. Danna Smith who works with the Dogwood Alliance, an nonprofit organization whose mission is to mobilize diverse voices to defend the unique forests and communities of the Southern US from destructive industrial forestry, and Gachi Tapia who has worked as trainer for several institutions in Latin America, East Europe and ex Yugoslavia. She has collaborated with experts in interventions aimed at a constructive transformation of social and political conflicts in Venezuela 2004, Middle East 2004, Bolivia 2008. Reflecting on the 2010 Gulf Oil Spill, three people, who have placed their relationship with nature at the center of their lives, offer their thoughts on how we can make peace with nature. When the British Petroleum Deepwater Horizon Oil Rig exploded in April of 2010 and set off the largest accidental marine oil spill in history, virtually everyone viewing the disruption, to wildlife and the lives of people in that region, was devastated. We felt like it probably set off an inner conflict in many about human’s relationship with nature. For today’s program, we sought out some voices of people who have already placed that relationship at the center of their lives to see how their experiences and thinking might help us all grapple with this conflict. A lot of the headlines during the three months when the oil gushed into the gulf framed the event as an attack or war on nature. How can we think and act to make peace with nature. Today we speak with Daniel Schwartz, a social ecology professor; Kathy Sanchez, a Native American environmental policy activist; and John Francis whose response to an oil spill in 1971 was to quit riding in motorized vehicles for 22 years, walk all across the country and, during 17 of those years, not to speak a word. In all that time he completed bachelor’s masters and phd degrees in land management. Carol Boss hosts with Paul Ingles. Divorce can be one of the most challenging conflicts one can face. On this edition of Peace Talks Radio, we'll hear the divorce story of the couple who created and still work together to produce Peace Talks Radio: Paul Ingles and Suzanne Kryder. Guest reporter Sasha Aslanian tells how the couple managed to steer around divisive divorce troubles and stay friendly, civil and even helpful to each other in the post-divorce years. Also, a conversation with a therapist who offers ideas about managing divorces that don't go so smoothly and may involve children. In the U.S., about 50% of all marriages end in divorce. Divorce is often described in the language of war. The ex-spouses battle over possessions and children. Attorneys look for ammunition. The warring partners burn bridges, plunder bank accounts, and drop bombshells. In a sense, the script is already written for us. Divorce is a civil war in a family. But does it have to be that way? What happens when both parties want to write the ending a different way and divorce peacefully? Can they? On this edition of Peace Talks Radio , we'll hear the divorce story of the couple who created Peace Talks Radio and still work together to produce it: Paul Ingles and Suzanne Kryder. Guest reporter Sasha Aslanian tells how the couple managed to steer around divisive divorce troubles and stay friendly, civil and even helpful to each other in the post-divorce years. Also, a conversation with therapist Samuel Roll who offers ideas about managing divorces that don't go so smoothly and may involve children. Finally, some examples of programs that help couples and kids find that peaceful place after divorce. Massasoit was the leader of the Wampanoag Confederacy when English settlers landed at Plymouth Rock in 1620. He and his people kept the Pilgrims from starving in the early years of their settlement, attended the first Thanksgiving and forged a peace treaty with the English that lasted 40 years until his death. We'll talk with American Indian scholars Darius Coombs and Bob Charlesbois who'll fill in the details of this Native American leader's attempt to make peace for his people and with the new strangers. Also, Native American film director Chris Eyre on his portrayal of Massasoit for the 2009 PBS television series We Shall Remain.